In high school I worked at my local Old Navy in the suburbs of Columbus, Ohio. I'll never forget when walking the store I encountered a preschool aged girl who was staring intently at me as her mother pushed her cart. I greeted the little girl who didn't reply but just kept staring. 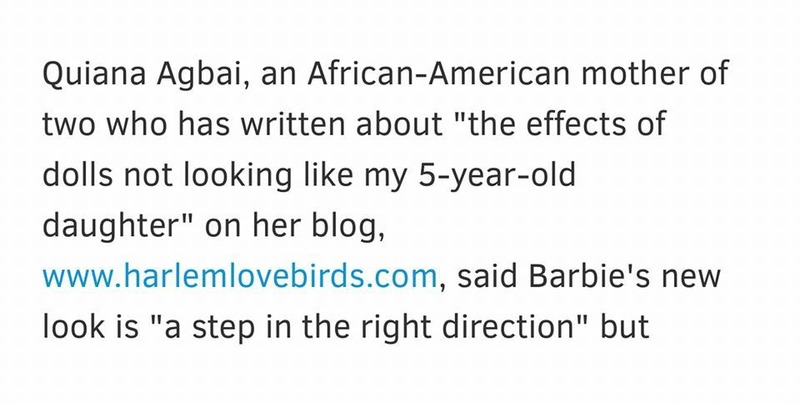 Her mother explained sheepishly, "Oh excuse her - she's never seen a black girl before." I was completely baffled. It wasn't like Columbus is devoid of black people and in my mind I wondered how could this have happened. Over the years this encounter stayed with me, and I've pondered if that mom ever showed her child diverse TV programming, sought out friends of color for her daughter or even bought her baby dolls of color. We are in the modern era and there really are no excuses! Now as a mom I'm very careful how I curate my children's toys and while the majority are gifted to us, early on I made a premature decision that I wasn't going to purchase Barbie dolls for my daughter or let her watch mainstream princess movies. Well, that went out the door quickly as Barbies started trickling in as gifts and others showed her princess movies when I wasn't around. And guess what? We're still alive! I figured out it's not just about giving children dolls, but having conversations too. As a parent I have a role to play in how these things shape my children's self-image, and I understand how a lack of diversity in their toys, books and programming impacts them. I'm even more sensitive to this now living in an overwhelmingly homogenous state. 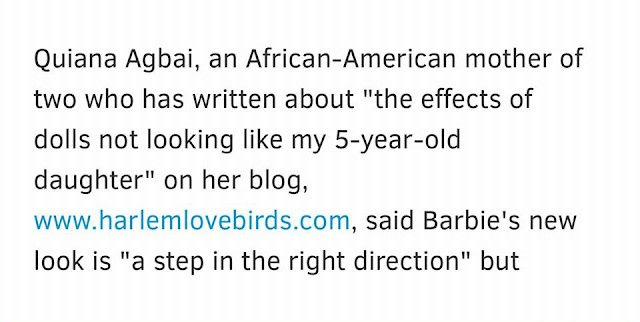 When I heard the news about yesterday's launch of the redesigned Barbie, I was excited that a major, worldwide brand was stepping up but I also saw it in context of the specific challenges I've faced in introducing dolls to my daughter as we're part of the African diaspora. Mr. Lovebird and I have discussed early on how to introduce both of our cultures and family history to Nia. As his family is Nigerian and mine is African-American we represent the enslaved and non-enslaved aspects of the African diaspora. As I mentioned in the article, the American Girl doll Addy was present in my childhood home, and while I have my childhood Samantha doll in our basement, I'm not sure how I feel about Nia playing with either. At least right now. 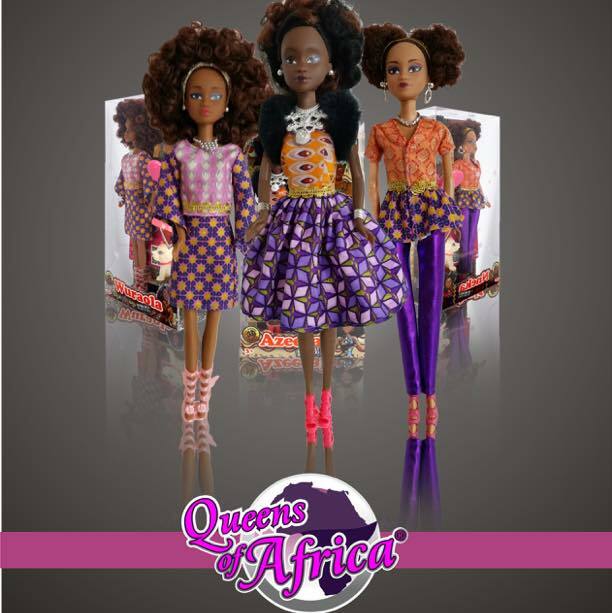 Last year the brand made headlines when they overtook sales of Barbie in Nigeria. Incredible! I'm happy to hear this and support African businesses. In addition to Queens of Africa, another brand representing the diversity of the African diaspora is Natural Girls United - I may have even considered some of these dolls hairstyles for my own next hairstyle! I could see a party with a diversity of dolls for Nia being a hit - boys included! Grayson loves to play with Nia's dolls when she's away at school and refers to any Barbie as "meh-maaade" (mermaid). It cracks us up but we're all for it! 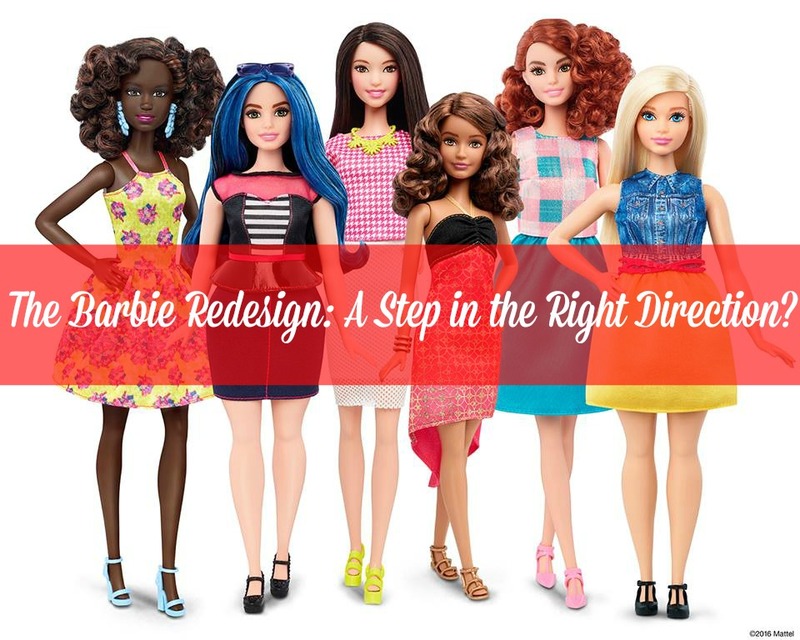 What are your thoughts on the redesigned Barbie? A step in the right direction?